For centuries, artists have carved beautiful forms from alabaster, a mineral prized for its texture and translucence. These qualities make it a perfect choice for lighting. Our Natural Alabaster collection is traditional in design, with alabaster shades painted with ornate cast brass frames in a bronze or French white finish. 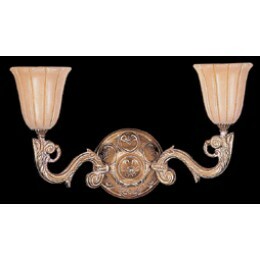 The Crystorama 892-WH Natural Alabaster collection Sconce Wall Lighting in French White uses Incandescent light output and brings Antique style. This item is 14"H x 21"W x 9"D. The total wattage is 80 and the voltage is 120 volts. The Crystorama 892-WH requires 2 bulbs. Additional Information: Shade-Alabaster Stone Shade(s).